I just received my dress today for my party. oh my God it is done and it's exactly like the picture the fabric is perfect I'm speechless in tears came on my eyes oh my God it is so beautiful. I can't wait to wear it thank you thank you thank you. MillyBridal was very patient with the order of dress in diffferent colours and did everything she could to send them in time. Conversation with her is perfect! The dresses are very nice. Thanks a lot for the grat communication MillyBridal! The dress is amazing. It fits my daughter perfectly. Thank you. 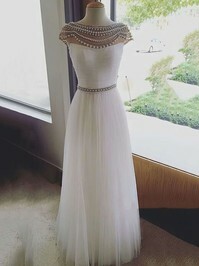 Shipping was very quick...got my dress within 2 weeeks. The fit was perfect. The dress was very elegant. Just what i wanted! I will order from Millybridal.org again! Very nice!!! Fast delivery and beautiful dress !!! Thanks!!!! I really love it...the fabric is of good quality.